So today was spa moving day! 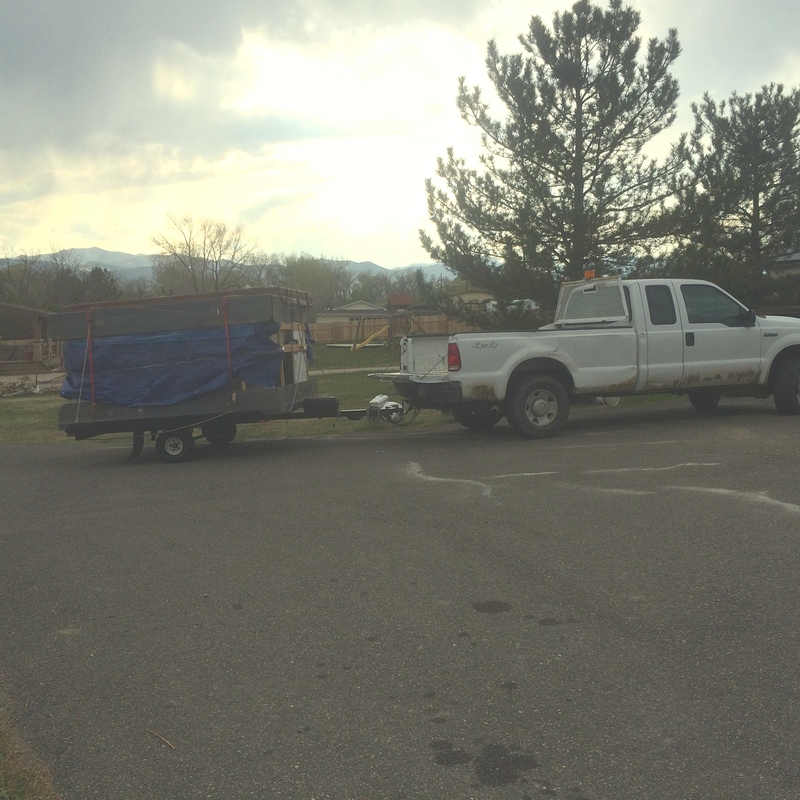 We hooked up the new trailer, stopped by Arvada Rent-alls and rented a Gin Pole and a set of 8 ton rollers. We also had filled up the truck with tarps, bubble wrap, tape, rope, strapping, a saw with a new blade for the fiberglass edges, wire to wire them on, bungees, a metal pry bar, both hand trucks and dollies, and the motorcycle lift that we had used for the heavy wood stoves. I also brought a few lengths of pvc pipes but didn’t use them, also didn’t use the hand trucks, and the dollies didn’t really work, but the gin pole and the pry bar and the motorcycle lift were great. The owner also had a floor jack that we used. It was quite a job and I was so involved I didn’t get any photos! But here is one of the spa on the trailer after we got home. I had a general idea about protecting the spa for the ride home by using an old pool bubble cover over the top and then putting on the fiberglass edges. But the pool cover was not big enough so we covered the top with a tarp first, then put on the bubble wrap, which I cut into two strips for two sides and then draped the rest over for the other two sides. We used regular packing tape to wrap around and hold it in place. Then we used two full size fiberglass edges for the long ends and cut two to fit between on the short ends. I bought a non-metallic carbide tipped blade for the circular saw that worked well on the fiberglass. The top fiberglass edges were wired to each other across the spa top to hold them on. Then the bottom edge was covered with fiberglass edges by screwing them into the frame that held the siding. We jacked the spa up to take out the 4 x 4s and cement blocks that were underneath it then we used blocks just at the middle to keep it high enough to put on the edging. Once the edges were protected for travel and to keep the metal from getting scarred from dragging on the cement, we jacked the spa so that it was lowered to the heavy roller blocks. They were difficult to keep under the spa. Maybe pipes would have worked better here. The rent on the rollers was rather high. Might have been able to buy more pipe to use instead. The spa frame kept slipping off the roller blocks when the cement dipped and rose so we had to keep stopping and put them back in place. The gin pole really helped redirect the front of the spa so it would go up to the trailer evenly. When we got the spa to the end of the patio, some neighbors came over to help! Boy that was fortunate as getting the spa up onto the trailer took a lot of team work. The guys lifted at the sides with 4 x 4’s while the rest of us pushed it from the back. We also had a couple of tries at putting the roller blocks under the front to roll up onto the trailer but they wouldn’t stay in place. We hooked up a winch to the back of the truck to help hold the hot tub and keep it from slipping backwards. It wanted to pull the spa to one side though and after it was on the trailer that was not helping. Eventually the 4 x 4 prying from the sides tipped the balance and we were able to use the motorcycle lift to get the back of the spa up high enough to push it the rest of the way onto the trailer. Once on far enough the trailer was pretty easy to tilt up into place and shove the spa the rest of the way down the trailer. Then we just had to use the ratchet straps to hold it down and an extra rope to fasten it front to back and we were ready to roll out the driveway and home! Took some coaching to back it up through the gate and be on our way. We didn’t get home until almost 5 p.m. so not remembering the hours of the rental place I hustled the borrowed goods back to the rental agency but made it with plenty of time to spare, as they closed at 6. It cost $72 for both items. So that made the spa move part a total of about $800. But we still have to move it into place once the cement pad is poured. An amazing thank you to the owner for lending us tools and helping with the whole process and his two neighbors who just came over to help and really put their backs into it as well as figuring out the side 4 x 4 pry technique. We will leave the spa on the trailer until the slab is ready. This entry was posted in Reduce Reuse Recycle, Spa, Tools. Bookmark the permalink.